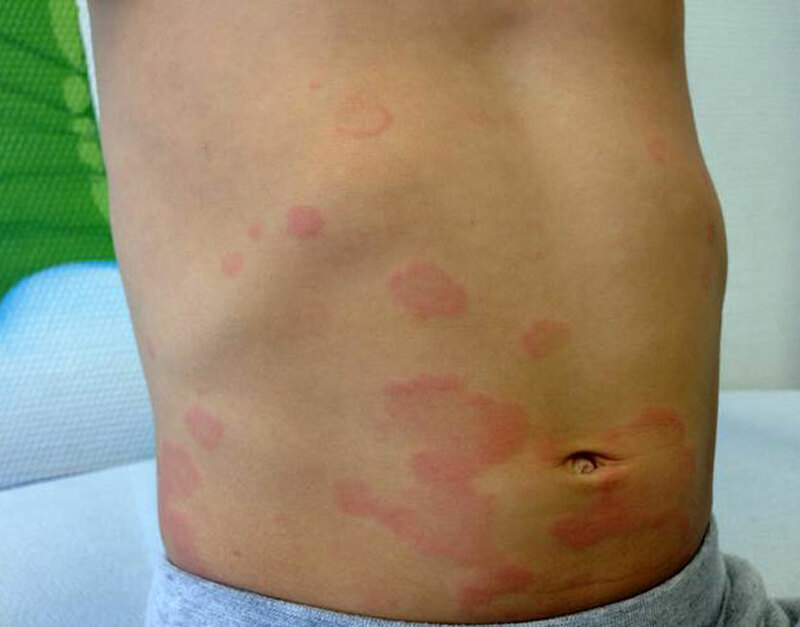 Hives or urticaria are itchy red welts which persist from fifteen minutes to several hours. They usually come in crops several times a day. They appear suddenly and leave no trace when they go. Angioedema is characterised by deeper swelling in the skin, which may take over 24 hours to clear. It is not usually itchy and can affect the lips and tongue. Dermographism is when you can “write” on the skin. Some patients have one or the other condition, others have all. Hives are a type of allergy. They are brought on when something (a chemical, medicine, infection, food etc) triggers the release of histamine. Once begun the hives may easily be aggravated by numerous other elements like heat, cold and pressure. Common causes of urticaria are aspirin, non-steroidal anti-inflammatories, penicillin and tonsillitis. In 2/3 of chronic cases of urticaria persisting longer than six weeks, the cause remains unknown. Although urticaria can be distressing because of the itching and its appearance and may severely impact quality of life, it has no direct effect on general health. Rarely, the swelling of angioedema may affect the tongue or throat, causing difficulty with breathing or swallowing and this is a medical emergency. Treatment revolves mainly around identifying potential triggers and treating with antihistamines. The dose of the pill may be changed from time to time. You may even need to take two different types of tablets at the same time. The experienced team of dermatologists at Atlantic Dermatology and Laser will take the time to put on our Sherlock Holmes persona and help you identify possible triggers. We will keep close tabs on you to make sure that we gain control over this potentially debilitating condition in the shortest space of time.